Generally, when someone gets into watches one of the first places they’re going to go is either Seiko or Citizen. This will generally dictate your brand allegiance from the start and it may prove difficult for you to look elsewhere. Myself, the first watch I ever wore with serious intent was a Seiko SKX009 that I bought off my buddy Zach nearly 5 years ago. So, as the rule would go… I never really consider Citizen, until now. The watch is also a “lefty,” in that the crown is on the left side of the case, so when worn on your left wrist it can’t dig into the back of your hand. This does require that you take the watch off to adjust it, but we’d do this anyway, right? I guess, the one downside to this watch is the height, there’s really no way around its 18mm-ness. It’s tall, it’s gonna get knocked into things, but in the end, it’s a no-nonsense tool watch and that’s what it lives for. The Eco-Drive technology that Citizen uses is something that they have been developing for a long time. It’s part of their efforts to make watches that are powered strictly by the sun. In 2007 Citizen estimated that they have avoided the disposal of over 10m watch batteries by using the Eco-Drive movement, a remarkable feat if that figure is accurate. The movement itself is pretty straightforward, quartz regulated, with a date complication. The Citizen Calibre B873 boasts an impressive 180-day power reserve, so… if the watch was exposed to bright sunlight it would take 11 hours to fully charge, on a cloudy day 40 hours, and 8” under a 30w fluorescent bulb 130 hours. Which seems like a lot until you realize that unless you lock it in a light-tight box, it will always be passively absorbing some energy. Anyway, very cool tech, and a good workhorse of a movement. According to the writing on the case-back, it’s anti-magnetic as well. The case is massive. If you, like me, measure watches in measurements of Oreos, this is solidly 1.5 double stuff Oreos on the wrist. As I said in the intro, it wears very much like a Seiko Tuna, the lug to lug is fairly diminutive on the wrist. It has a very solid build feel though, nothing rattles, the bezel is tight (but useable) and it just feels “monolithic,” on your arm. The crown, however, is a little bit if a different story. It’s a bit fiddly, can be a little tough to catch the threads when you’re screwing it down, but I believe due to the quartz nature of the movement you shouldn’t be adjusting it that often. It’s unlikely that you’ll encounter these issues more than a couple times a year. Alrighty, top-down; the bezel is large and in charge (there’s a theme with this watch…) there are polished scallops on the bezel between the elapsed time indicators. Between the bezel and the crystal is a marked ring with indicators for the individual minutes. The bezel itself is a nice 60-clicker, works well, turns with just the right amount of force, it’s a good bezel. The crystal is a flat mineral crystal not much to say there. The dial, well, it looks small compared to the case. The whole watch has a “cartoon-y” appearance to it; from the small dial to the large numbers on the bezel. It’s super legible, however, with the oversized hands and the orange minute hand. (These continue the cartoon-y theme in my opinion.) A note on the lume, it’s blue and pretty bright. Seiko is still the lume king, but the Citizen’s is perfectly adequate for your needs. The Citizen Promaster Diver comes on a rubber strap that actually screws onto the case itself. I’ve tried on the Rubber strap, but almost immediately switched to using lug adaptors and a canvas strap. The watch does wear nicely on the wrist with either option. The OEM rubber is a nice vented strap with a substantial signed buckle and keeper. I just prefer the look and feel on canvas, and that would be my suggestion. Alright, to wrap up my look at the Citizen Promaster Diver, I think it’s important to say that I’m not sure this watch is right for most people. I think it ‘could’ be right for anyone that’s looking for a supremely over engineered dive watch but, it’s going to wear large and look large so you need to be comfortable and ready for that. I am a fan, but admittedly it doesn’t see a ton of wrist time, I generally opt for slimmer pieces. They are very affordable though, so that’s a good plus. You can find them on Amazon new for just over $250, and used they generally go for $180ish. 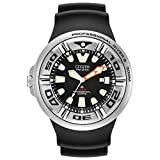 Editor: I recommend purchasing the Citizen Promaster Diver BJ8050-08E at Amazon or Jomashop. Please consider that buying anything through any of the links on this website helps support BladeReviews.com, and keeps the site going. As always, any and all support is greatly appreciated. Thank you very much. Nice to see a review of an old favourite. I’ve had a titanium version of this watch for what must be close to 20 years, and it’s been a great servant. I agree with the comments on size – I’ve found it impossible to hide it under a shirt cuff, but it does indeed wear comfortably otherwise. Mine has the OEM rubber strap, and that has been fine in use, although like many of us, it doesn’t enjoy the cold, being very stiff to put on. Once on the wrist and warmed up, though, it’s great. I’ve found the blue lume to be good, as well, with it lasting quite a few hours after charging. The only negative I’ve found is that the orange colour on the minute hand has faded back to almost white over the years, which in my view, has taken some of its character away, if not its functionality. Mark, Thank you for taking the time out to leave a comment, and for the kind words. I am glad to see you are enjoying the watch reviews!